The secret to a healthy smile relies on preventing issues from developing in the first place. This not only keeps your teeth and gums healthy, but it also helps to lower the cost of your dental care by preventing the need for an invasive treatment in the future. Dr. Parker understands the importance of prevention. In addition to cleanings and checkups, he offers an array of services to protect your smile from damage, including oral cancer screenings, fluoride treatments, and more. Not only are the services you receive important but your comfort as well. You will not want to visit the dentist if you walk into the office feeling unwelcomed. Dr. Parker and his team strive to make you feel like you are right at home from the moment you walk through our doors. Our kind and compassionate dental team will cater to your comfort while giving you the peace of mind you need to feel at ease about your treatment. Everyone has different oral health needs, which constantly change over the years. To help you reach and maintain your dental health goals, you need an individualized approach—not a “cookie cutter” plan. Dr. Scott views each patient as an individual to develop personalized solutions that accommodate your specific needs and comfort level. He will take the time to get to know you and answer your questions to ensure that your treatment plan is the best option for you. Your life is busy. You need a dental office that accommodates your schedule with a convenient location and flexible office hours. 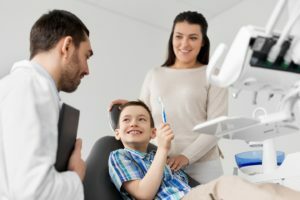 To help ensure that time conflictions do not stand in the way of your dental care, we are conveniently located off Christopher Columbus Transcontinental Highway. You will enjoy easy access to our office with hours that compliment your daily commitments. Benefit from the Best Today! When it comes to your dental care, you should not have to compromise to get the services you need. Choose the trusted dentist who is worth the drive to achieve a healthy smile. Dr. Scott Parker is committed to helping families in the area maintain healthy, beautiful smiles. He provides the personalized care your loved ones need. With a mission for excellence, he will meet your expectations to provide you with the services that your family deserves. Contact our office today to experience a better side to dentistry.